I used to hate grilling chicken. Despite its apparent simplicity, chicken is one of the trickiest foods to prepare over live fire. It is obviously important to thoroughly cook chicken from a safety perspective, so undercooking is always a risk. On the other hand, chicken burns and dries out quickly when overcooked. This leaves little room for error when trying to grill chicken. The solution to this problem is simple – indirect heat. Or, more accurately, a combination of direct and indirect heat. A hot sear followed by a longer period of indirect cooking to ensure doneness, maintain juiciness and pick up that delicious smoky BBQ flavor. This process works with or without sauce, but I like to sauce my chicken as the chicken is finishing up. This caramelizes the sauce, but doesn’t burn it and doesn’t let it stick all over your grill grate. As for the vegetables, nearly any vegetable that can be roasted can be grilled. For this particular meal, I made broccolini and zucchini, but other favorites include asparagus, green beans, carrots and baby eggplant. To keep things simple, I usually just coat with a little olive oil, salt and pepper and toss the veggies on the grill for the last 10-15 minutes of cooking. 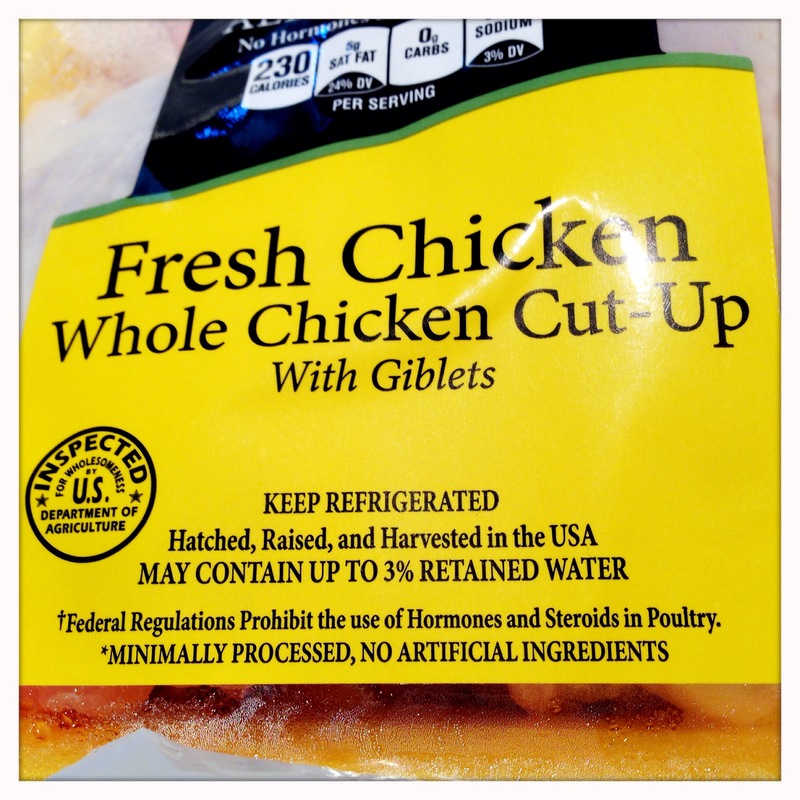 So, get yourself some chicken, fire up the grill and lets get started! I usually buy a whole chicken and butcher it myself to save money, but I happened to come across this broken down whole chicken for only $1.79 a pound. For that price, I decided to save myself the time and energy. I also always try to find meat with as little processing or “enhancing solutions” as possible. This chicken was perfect! If we are going to be using both direct and indirect heat for this chicken, we need to set up the grill accordingly. If you are using charcoal (which I recommend), set up a two zone fire. This means, once your coals are lit, arrange them so they cover about 1/2-2/3 of the grill leaving the other side of the charcoal grate empty. I use one full chimney of all-natural charcoal (lump or briquettes, your choice). If you’re using gas, fire up one half of the grill’s burners to medium-high. While the grill is heating up, we can prep the food. Rinse the chicken pieces, and pat dry with paper towel. Lay the pieces out on a cutting board, and very lightly coat with a little olive oil. 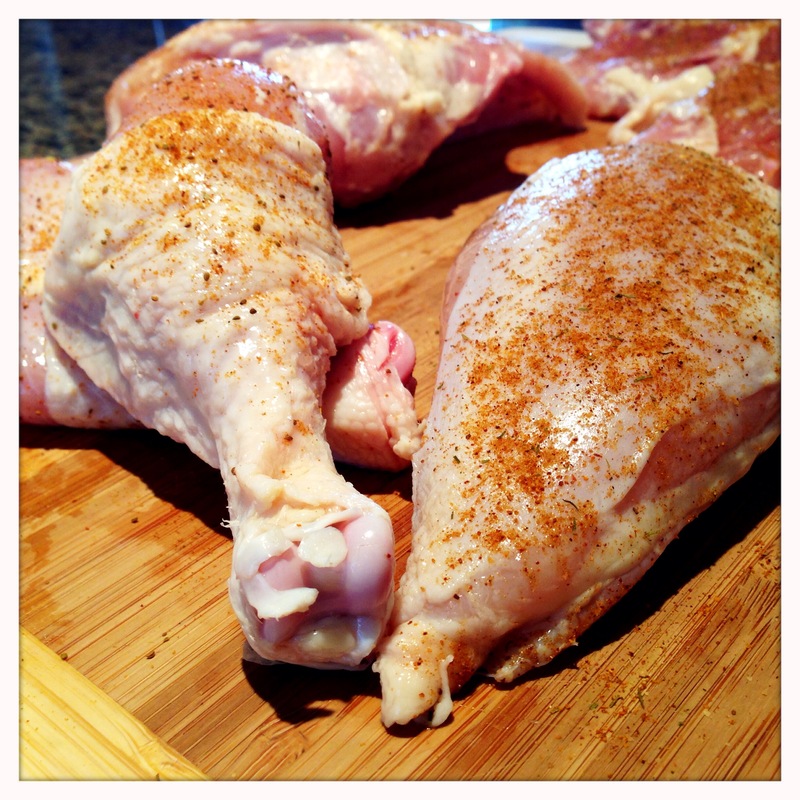 Season the chicken on all sides with the rub of your choice. I prefer Old Bay and add a little fresh cracked pepper, but for simplicity, plain kosher salt and pepper is a tough combo to beat as well. Next we’ll get the veggies ready. This general process can be applied to just about any vegetable you feel like grilling. 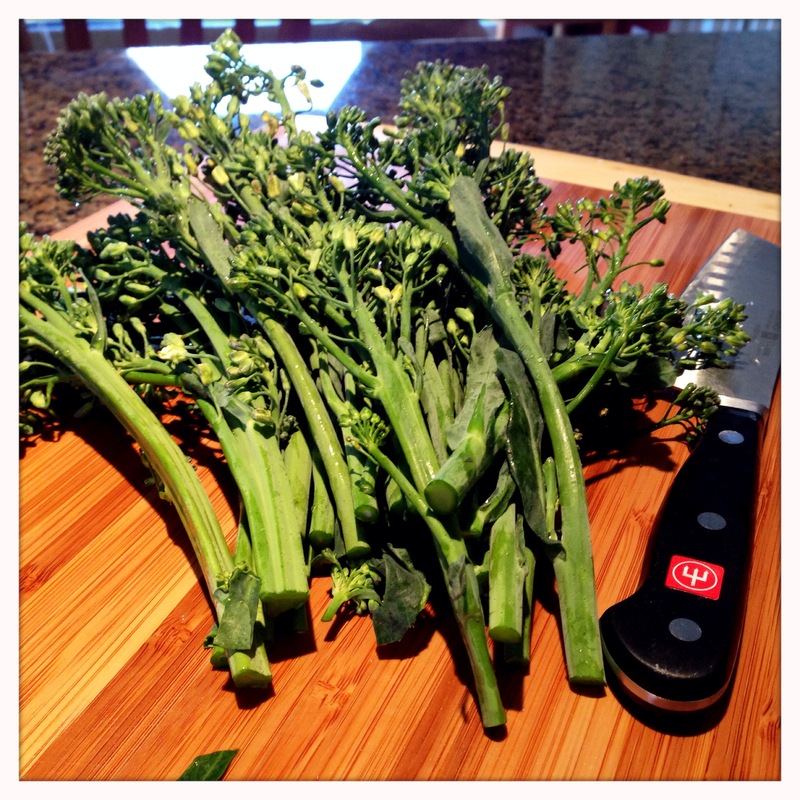 For the broccolini, trim off the tough and/or dry ends. Once they’re trimmed, toss with a little olive oil to coat, and season with salt and pepper. 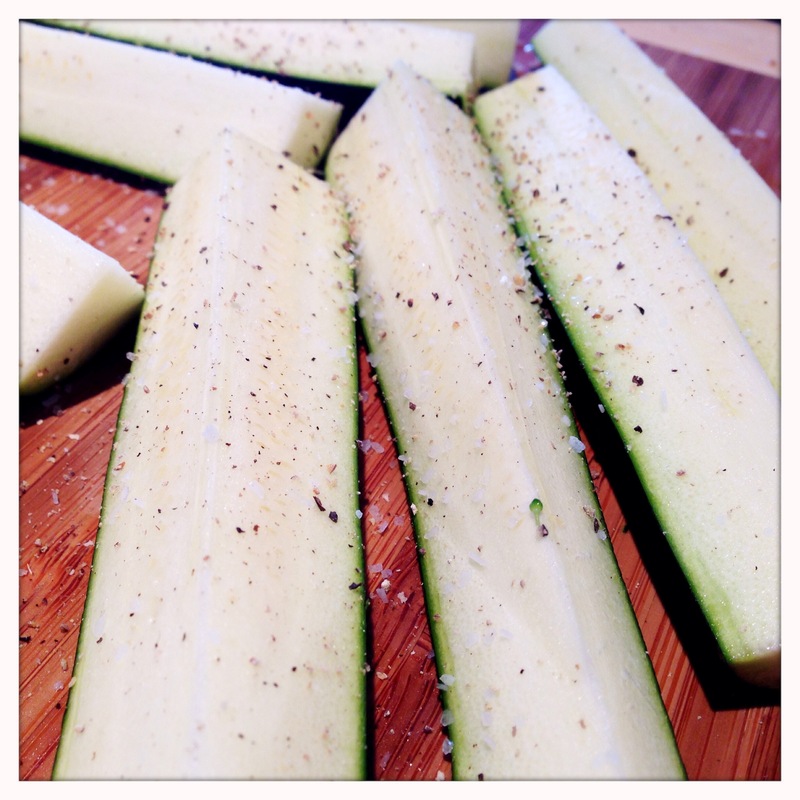 For the zucchini, quarter them lengthwise. Coat lightly with olive oil, and season with kosher salt and fresh cracked pepper. By now, the grill should be plenty hot. Place the chicken onto the grill, skin side down, over direct heat to sear. This only takes about 5-7 minutes. You’re looking to get some good color and crispiness onto the skin. After you’ve seared the chicken pieces over high heat, it’s time for the indirect cooking. 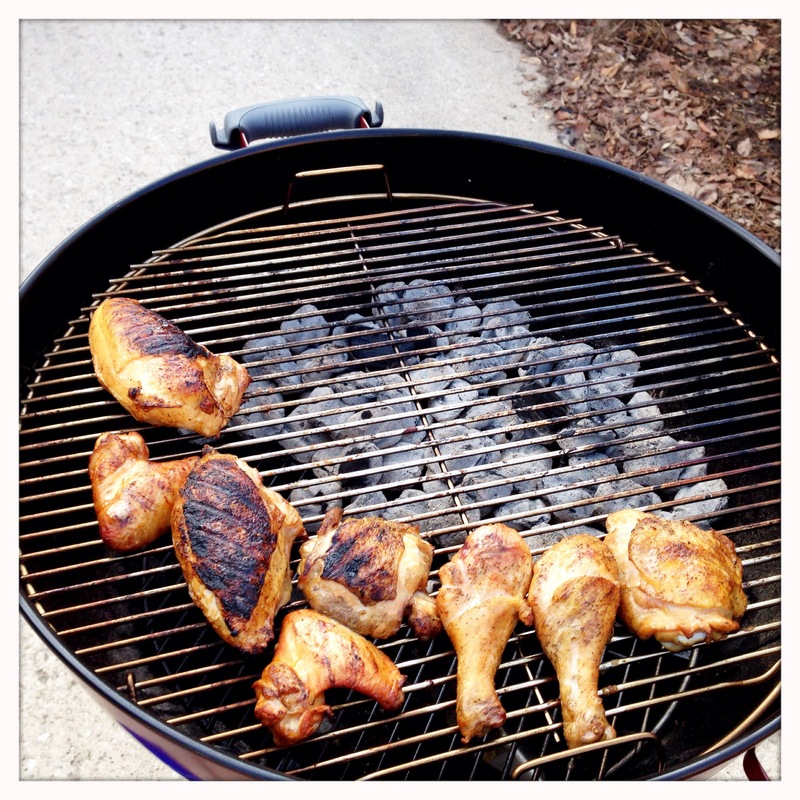 Arrange the pieces of chicken on the grate away from the coals (or lit burners). Place the seared skin side up for the remainder of the cooking time. I like to throw 2 or 3 chunks of wood on the coals for this part as well to add some smoke flavor to the chicken. I usually use apple, cherry or pecan wood. 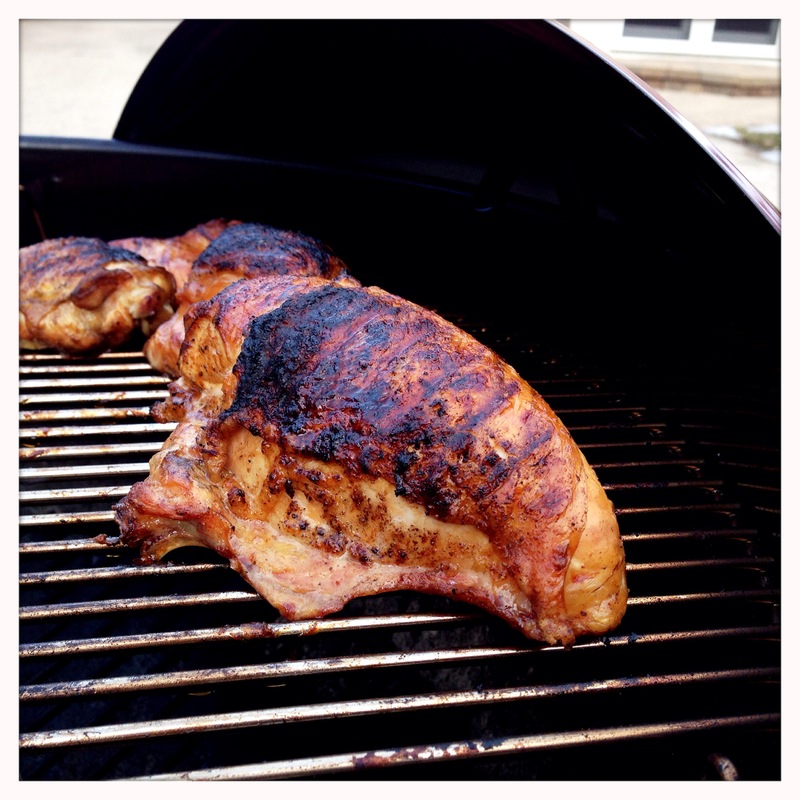 Even on a gas grill, adding some wood chips in a smoker box will add some serious BBQ flavor to the meat. Depending on the temperature of your grill, the chicken will cook for about 30-45 minutes from this point. With indirect cooking, think of your grill more like an oven. 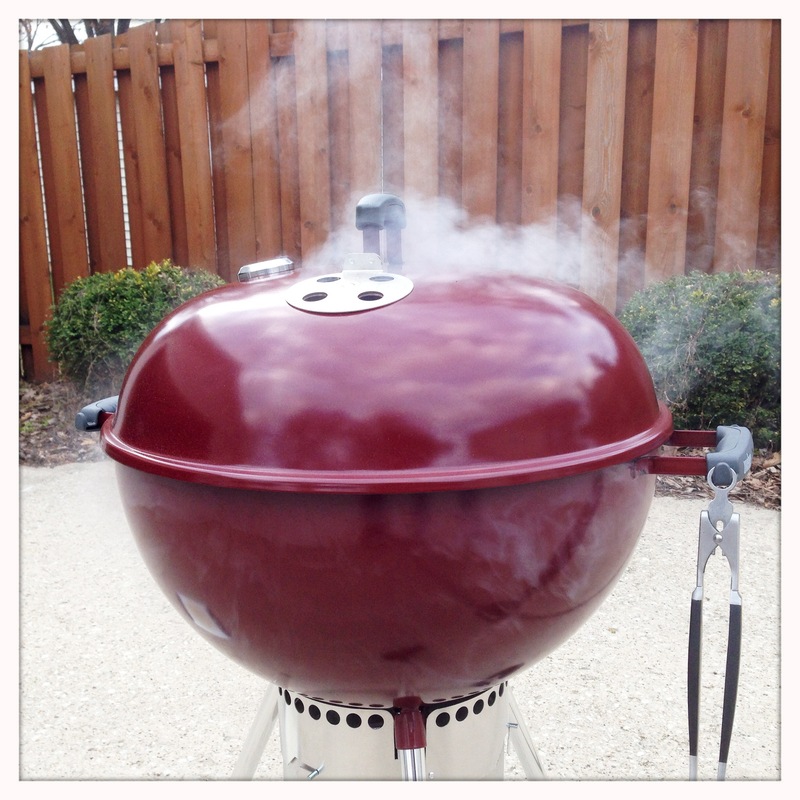 The cooking is primarily happening because of hot air around the meat rather than the direct heat of the flame. I find this makes timing easier to manage as I can relate easily to how long chicken should cook in an oven at 325, 350 or 400 degrees. I recommend, as always, not trying to fight with the grill here. It will ultimately settle in at some temperature, and instead of trying to force it to the temperature you want, simply adjust your cooking time based on the temperature of the grill. My grill settled in a little over 375 degrees, and I let the chicken go for about 35 minutes, which ended up being perfect. Most important is to keep the cover on. Nearly all of the heat is lost every time the cover is removed, so do whatever you need to do to avoid the urge to peek too early. When there’s about 10-15 minutes left on the chicken, it’s time to add the vegetables. Cook the vegetables over direct heat to your desired level of char and doneness. 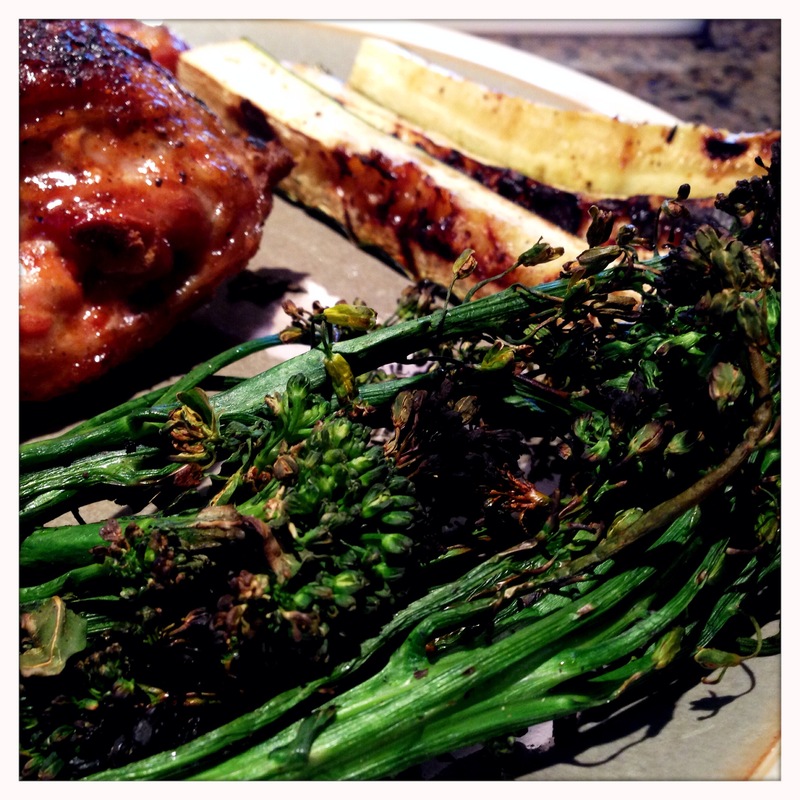 When cooking stalk vegetables like broccolini or asparagus, turn frequently to cook evenly and prevent burning. With zucchini, and other meatier vegetables with higher moisture, it’s important not to turn to soon as they are more likely to stick when turned to soon. If you like BBQ sauce on your chicken, now is the time to sauce as well. To prevent making a mess of your grill, use a brush or mop to sauce the meat and only sauce the top surface. 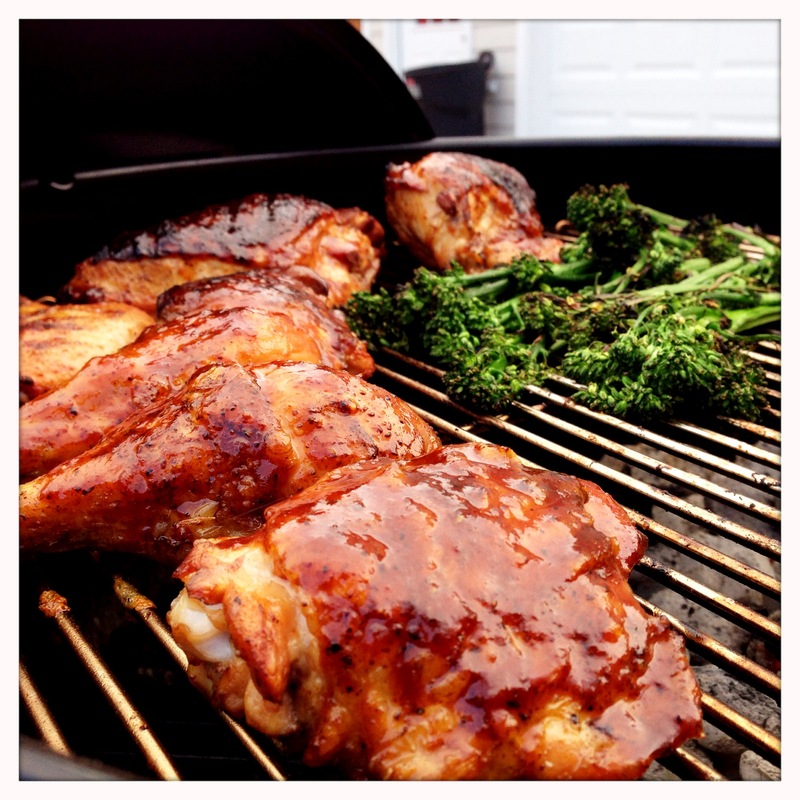 Cover the grill after saucing, and let the sauce caramelize onto the surface of the meat. Once everything is done, put it on a plate and enjoy. 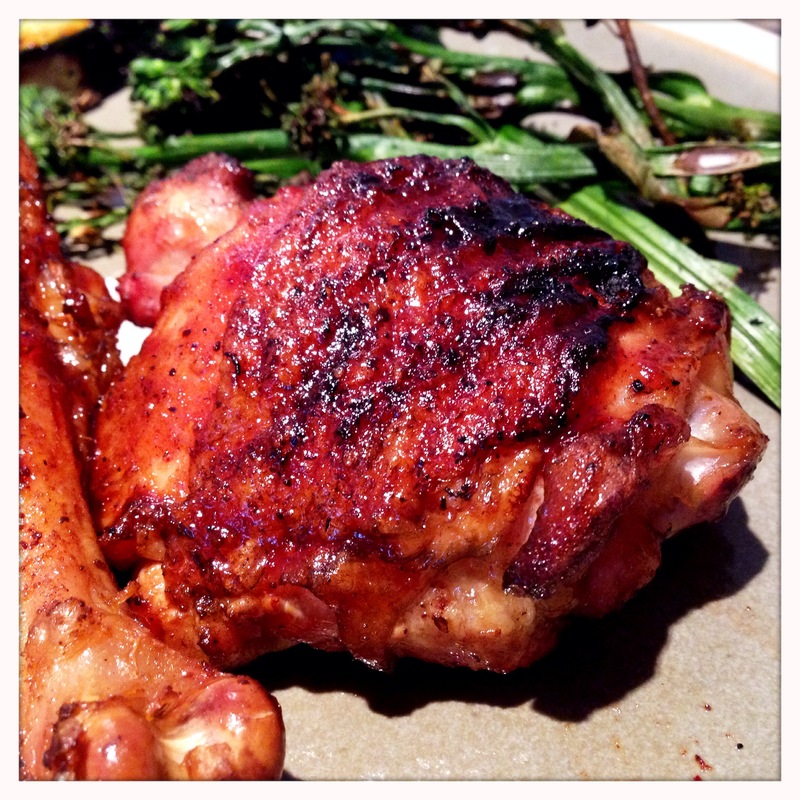 The chicken will have a beautiful grilled color, but still be juicy and tender inside. 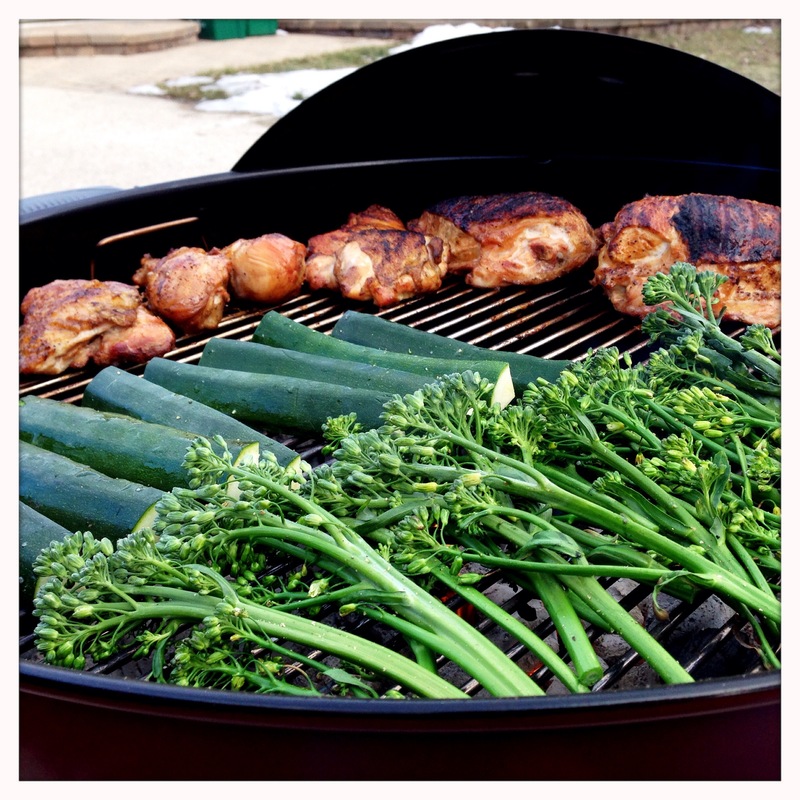 The vegetables will pick up some of the smoky BBQ flavor, but also retain more of their freshness when grilled instead of steaming or other wet heat methods of cooking. 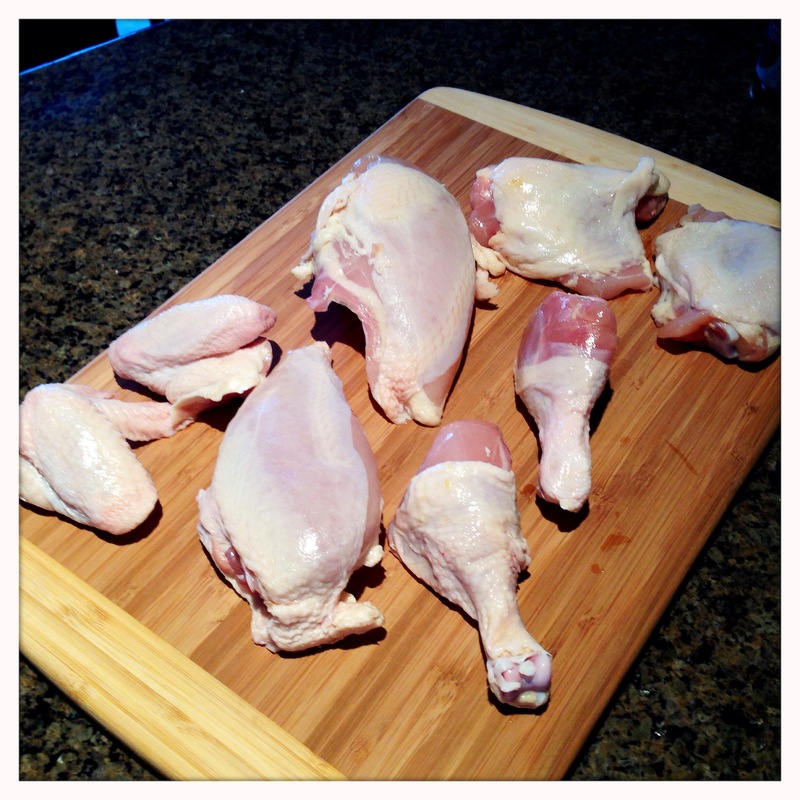 I hope this post helps you feel more confident when it comes to grilling chicken. 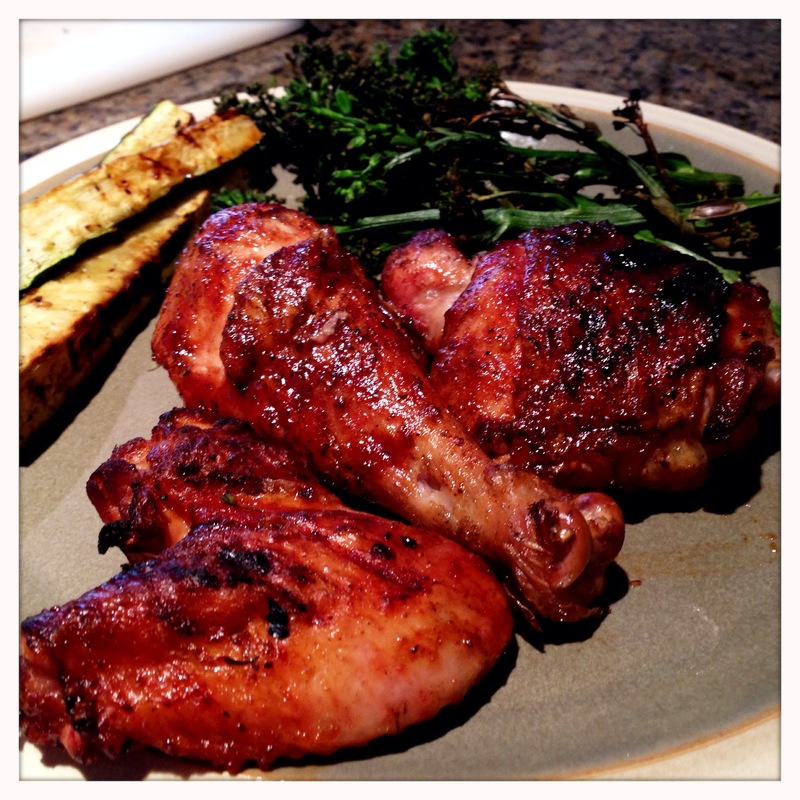 A perfectly barbecued chicken is one of the great joys of summertime, and I know I went too many summers suffering through the frustration of grilled chicken that was burned on the outside and questionably rare on the inside. Since switching to a direct/indirect combined cooking method, I actually look forward to making chicken outside, and the results are always delicious. Eaters of all ages will love it – Enjoy!